Where are you? Home > News > Irish based Band Kila launch their 9th studio album "Soisin"
Irish based Band Kila launch their 9th studio album "Soisin"
Soisín is the ninth studio album from traditional/fusion band Kíla. Portraying a softer side to the band, the album is entirely instrumental and features violin, saw, guitar, mandolin, flute, uilleann pipes, double bass and percussion. The music is gentle and slow. This is music to rest, reflect and even to cry to. Probably better known for their up beat live performances, and although all their previous albums have slow pieces, this is the long awaited album which brings the softer/ gentle aspect of their musical expression together. 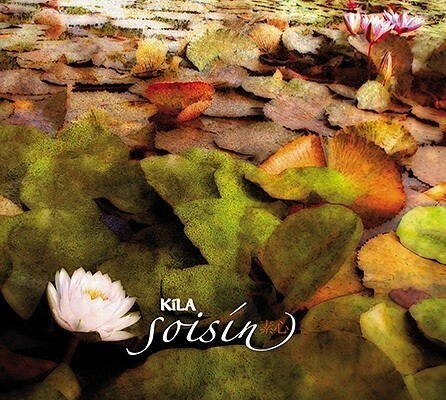 Following the release of Luna Park in 2003, Kíla wanted to record a yin and yang of albums. Gamblers’ Ballet released in 2007, which was the yang the dancing music, and this is its matching counterpart, the yin, and the spiritual. This is music to relax to. Soisín shows both the exceptional musicianship of each of the members and that Kila are very much connected to the invisible thread that ties generations of Irish musicians together. Soisín is named after, and dedicated to a young Irish woman, Máire 'Soishin' O'Halloran, who travelled to Japan to join a Zen Buddhist monastery and in three short years came to be regarded as a Buddhist Bodhisattva or a saint of compassion. She lost her life in a bus accident in Thailand on her way back home. While touring in Japan, Kíla flautist, Colm Ó Snodaigh heard and was inspired by her story. He wrote the tune Soisín, which, in turn became the name of the album. Film maker Rónán Ó Muiríosa recently produced a short film using St Germain, one of the album tracks, as the musical backdrop to his film. All of the photos that were used in the film were supplied by Colm as taken during a recent tour with some coming from Louvain, Dublin, Bristol, Bobbio and even Tory Island! Also following on from the success of the film The Secret of Kells, Kíla were invited by the Irish Film Board and Culture Ireland, to perform at a star studded party, hosted by the film board in Cannes at this year's film festival. Donald Clarke, from The Irish Times described Kíla's preformance as a 'raucous set' and one of the party attendees said that he chose Kíla instead of the Woody Allen Cannes film premier!